The student then looked at the three of us for approval. 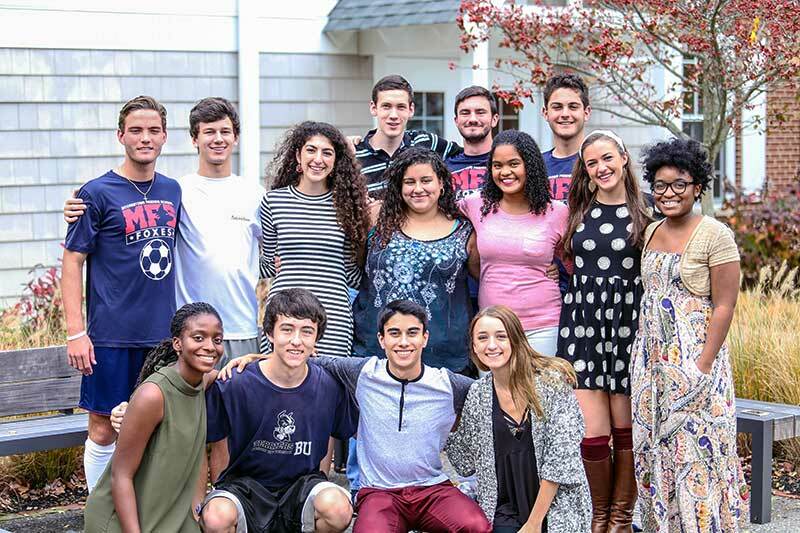 As the faculty advisors for the Peer Leadership program at Moorestown Friends School (MFS), we initially expressed concern about leaving the 16 senior peer leaders alone in the midst of a challenge. But when a couple of peer leaders privately shared the broad strokes of the issue with us, we decided to leave the students to work things out on their own. After the three of us left the room, the 16 peer leaders talked about how to approach the ninth-graders in their care. They began by addressing the rumors they had heard about the negative ways some ninth-graders were using social media. The seniors then designed a lesson plan including the consequences of using social media inappropriately. The peer leaders split into pairs and conducted the lesson with small sections of eight or nine ninth-graders. When the three of us rejoined the group of senior peer leaders the following week to debrief what happened in their sections, we were pleased to learn that the peer leaders successfully handled the touchy situation and influenced the outcome for the better. This real-life classroom lesson is one example of how our Peer Leadership program continually improves our campus climate and helps our students develop crucial leadership skills. The Peer Leadership program, which began in fall 2014, evolved over a series of conversations about how to foster leadership development in the 300-student upper school of Moorestown Friends School (New Jersey). The time was ripe to reflect on our school’s offerings, as we were in the midst of the Sustaining Excellence accreditation process with the Middle States Association of Colleges and Schools. We wanted this program to delve deeply into leadership by exploring the overall concept and nuances related to school and daily life. The program would need to extend beyond the ways students can lead in extracurricular activities — ways such as being the lead in a play, captain of a team, president of a club, ambassador for admissions, class officer, and so on. Several aspects distinguish the Peer Leadership program at Moorestown Friends School. In the yearlong course, the three of us guide a select group of senior students to study leadership theory and develop 21st century leadership skills. We focus on real-world scenarios when discussing theory and facilitating practice. In their peer leader roles, seniors mentor freshmen in their transition to high school, introduce them to high school traditions, and lead discussions on moral and ethical issues. We maintain a thorough selection process for the program. First, interested juniors must submit an application with answers to the following questions. Why do you want to be a Peer Leader? What strengths will you bring to the program? MFS expects Peer Leaders to be positive role models for the community. What does this mean to you? What would make MFS a more positive school environment? Describe a team or group you were a member of that did or did not work effectively together. What did you learn about yourself and about teamwork from this experience? Next, they participate in group interviews of six to eight applicants, where the three of us challenge them to answer questions about ethical dilemmas they face every day. Then, current peer leaders anonymously provide us feedback about the candidates. Finally, a selection committee meets — including the peer leadership team, the upper school dean of students, and the upper school counselor — to choose the 16 leaders. We employ the Quaker process to reach consensus. For those chosen as peer leaders, the school year begins with a weekend training workshop, where we gather to discuss the goals for the year and teach the students how to facilitate team-building activities for a ninth-grade student Fun Day. During the academic year, the Peer Leadership class meets twice during a six-day rotation. In the first class in the weekly cycle, the seniors meet with teachers while the ninth-graders go to study hall. In the second class of the cycle,seniors teach in pairs with a small group of ninth-graders. When the peer leaders meet with us, they draft a lesson plan for the ninth-graders with our help, debrief what happened during their small sections, and share overall thoughts on their progress. Peer leaders then move their lesson planning to the digital realm via a Facebook page and group text message threads they create. This electronic approach allows them to document their planning and address issues about “their students” in real time. As teachers, we have found these classes to be a barometer of our school’s current climate, and student feedback has helped us adapt the program to mirror the student experience. Within weeks of the first quarter of the year, we see an improvement in our school culture. The senior peer leaders display ownership and pride about their new role, and their positive behavior spreads through the senior class. The hallways become less intimidating and more welcoming spaces for all students. Ninth-graders, in particular, gain a greater sense of belonging. They’re more comfortable navigating the hallways, talking with upperclassmen, and meeting with teachers. Teachers, too, have commented about the program’s positive effect on the well-being of students school-wide. Beyond the school day, we credit the program with boosting participation at a variety of school events. It helps that the senior peer leaders encourage their freshmen students to attend upper school activities. And thanks to the program, attendance remains high at the Snow Ball, our winter formal dance. Now, we are teaching a new crop of 16 peer leaders and building on last year’s success. We were pleasantly surprised to discover that the first group of peer leaders did not stop advising their groups after they graduated. In addition, many members of the inaugural group have returned to campus to share their thoughts about college and provide support to this year’s leaders. These interactions underscore students’ commitment to the program. The current seniors are role models outside the classroom, too. They encourage their students to get involved in extracurricular activities and serve as key contacts for ninth-graders needing support with school or family issues. Not long ago, one peer leader met with an administrator to address an incident of academic dishonesty he witnessed in class. He said he was compelled to come forward — so he would not contradict the lessons he taught his ninth-grade students. The peer leadership program has become a draw for our school, as prospective families want to learn more about it, the admissions office reports. So the office now schedules most campus visits for prospective ninth-grade students on days when peer leaders teach current ninth-graders. The 16 peer leaders also work with the marketing and admissions offices to coordinate recruiting events for prospective students. We continue to be impressed by the senior peer leaders’ sense of purpose as they discuss with freshmen many challenging topics: stress management, ethical dilemmas, Quakerism, relationships, academic dishonesty, service learning, and peer pressure, among others. Their openness has given ninth-graders a safe environment to ask questions they would not dare ask teachers. It’s been exciting to watch our peer leaders grow and positively influence our community. We can’t wait to see how they amaze and inspire us next. Bolman, Lee G. and Terrence E. Deal. 2008. Reframing Organizations: Artistry, Choice and Leadership, 4th ed. San Francisco: Jossey-Bass. Dweck, Carol. 2006. Mindset: The New Psychology of Success. New York: Ballantine Books. Kouzes, James M. and Barry Z. Posner. 2008. The Leadership Challenge: How to Make Extraordinary Things Happen in Organizations, 5th ed. San Francisco: Jossey-Bass. Smith, Robert Lawrence. 1998. A Quaker Book of Wisdom: Life Lessons in Simplicity, Service, and Common Sense. New York: Eagle Brook.